Valentine’s Day is not always just for us adults and parents. One of the most fun things we can do this, and every, Valentine’s Day is to do some crafts with our children…as well as for our loved ones. When it comes to Valentine’s Day, it is so true that it means so much more when it is made by your own two hands, filled with love and memories. With the beauty in every unique craft, handmade item, and personalized card, you are sure to please the person you’re gifting. From printables to projects you’re sure to find something for everyone! There are endless options, these are my favorite 15 from awesome bloggers across the web (including myself!). 1) Mosaic Heart Art Project. One thing I have always loved about crafting with kids, is that it is extraordinarily educational. It may seem like good fun, but almost every time there is a learning perspective involved. With this Mosaic Heart your child will be practicing their cutting skills, which is a very important thing to master for a young child. 2) My Little Valentine Candy Boxes. I love this idea because it is so easy to up-cycle and reuse products you already have in order to finish this project. It is also highly customizable and you can style it in any way you want. Endless possibilities here! 3) Stunning Lace Heart Garland. It is easy to get constantly caught up in the reds and pinks during the Valentine’s Day season. But there is something extremely unique and elegant about lace, and lace hearts. Perfect for a romantic setting during a home date night. 4) Love Mug. Create an extremely unique and hand made mug for the coffee or tea lover in your life. As an avid mug collector myself, I think this is a very thoughtful and satisfying gift to both make and receive. 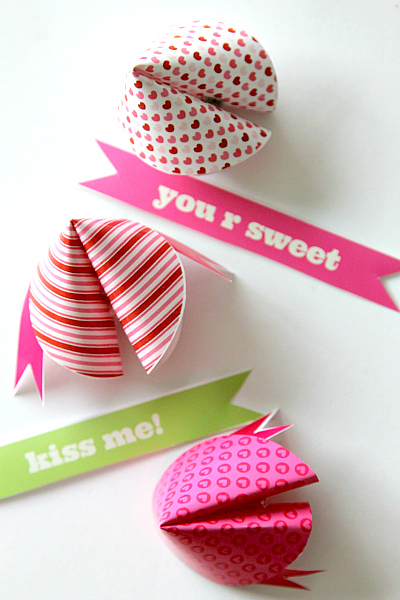 5) Printable Valentine’s Day Fortune Cookies DIY. This is one of my all-time favorite projects that I ever published here. It is a super unique way to get your Valentine’s out there, especially if you’re making them for a class. It is amazingly quick and easy to make a bunch all at one time without sitting around for hours and hours. Free printable included! 6) Heart Rocks. Let your kids get into the holiday spirit with heart rocks. The wonderful thing about this craft is that kids can do it all by themselves from start to finish. I’m sure you will have an entire basket full of heart rocks before you know it. What you do with them? Who knows. 7) Melted Bead Hearts. This is another craft that kids love. Although it requires some parental supervision, the outcome has always proven to be a huge ‘win.’ These can be used for kid’s jewelry, on other crafts, let your imagination be your guide. 8) Paper Heart Chandelier. 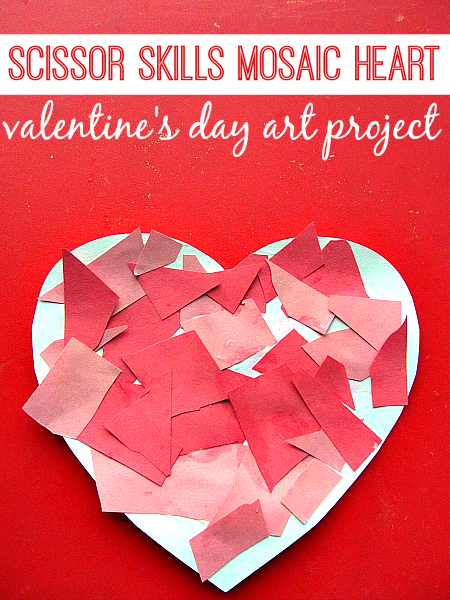 For all of the parents with toddlers and preschoolers at home, this is your Valentine’s Day craft best friend. This is a classic, and everyone I’ve ever known has made one of these (either as a chandelier or garland) at some point in their lives. A must-do craft for sure. 9) Chalk Heart Collage. Get yourself some dark card stock or construction paper, chalk, and some stencils and your kids will be entertained for hours. This would make a wonderful gift for teachers and grandparents. 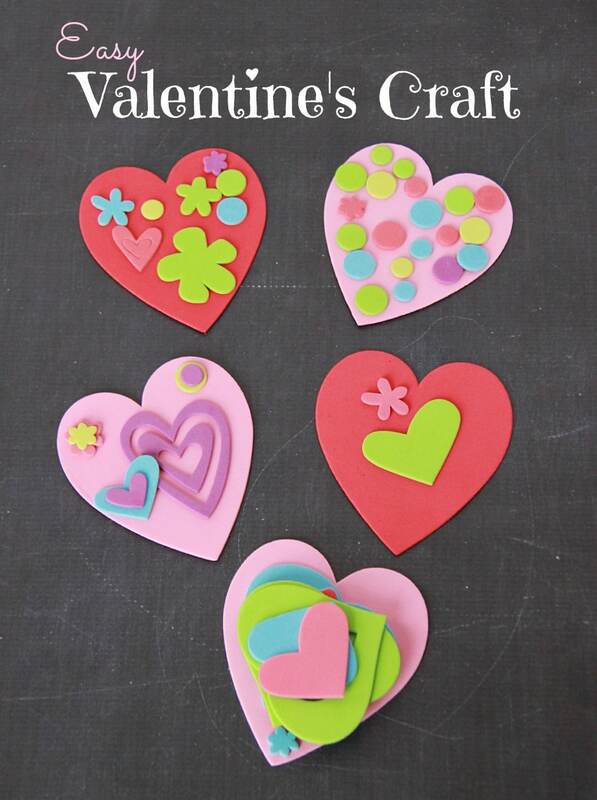 10) Easy Valentine’s Crafts for Kids. Using foam shapes is one of the best ways to expose your children to the world of creativity. They can create to their hearts desire, and each kid will always come up with something unique. 11) Heart Suncatcher Craft. For those of you who love to change up the decor in your house for each holiday, this is a craft you definitely need to let your kids make…for you. Once these are done, they look gorgeous and you will greatly enjoy looking at them the entire season. 12) Valentine Heart Button Craft. Are you an avid crafter? How about someone who sews? Then I bet you have a ton of spare and extra buttons laying around. This is the perfect time to put them to good use, extra bonus points if they are red or pink. 13) Fingerprint Love Bugs. Love bugs! Such an adorable name for a craft every child should make for their parents. It definitely brings the “awwwww” factor. 14) Sewn Valentine’s Treat Bags. Give your Valentine’s gifts a little extra spark with these sewn treat bags. The look is different enough to really catch the eye of anyone who sees it. 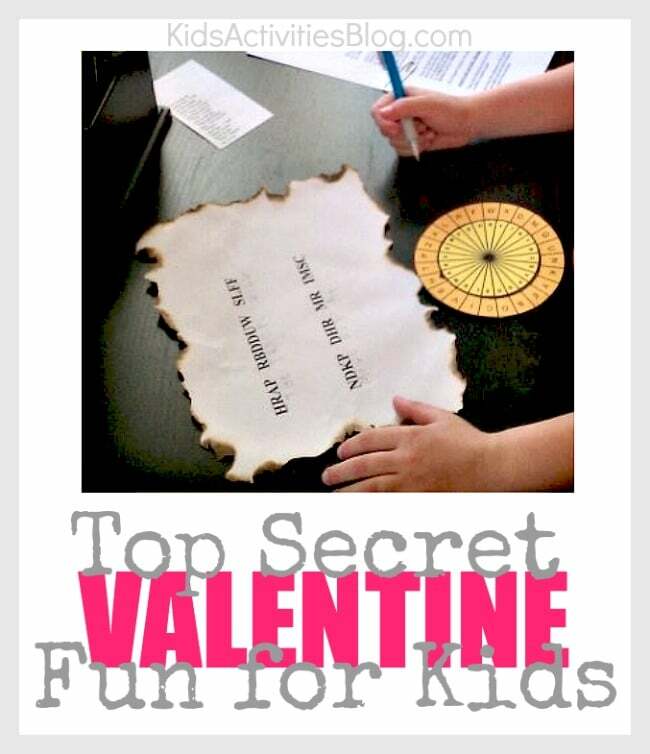 15) Top Secret Valentine for Kids. Get your kids decoding in a fun and adventurous way. Kids love having a scavenger hunt, and letting your older kids help make this is a sure way to get the entire family involved. Remember: Valentine’s Day is about love and happiness. No pre-made, store bought gift will do it justice. Only you know the people in your life, and your special touch on any craft or gift will make it the best Valentine’s Day ever. Want more? Click below to see more great ideas or visit us on our pinterest page here!